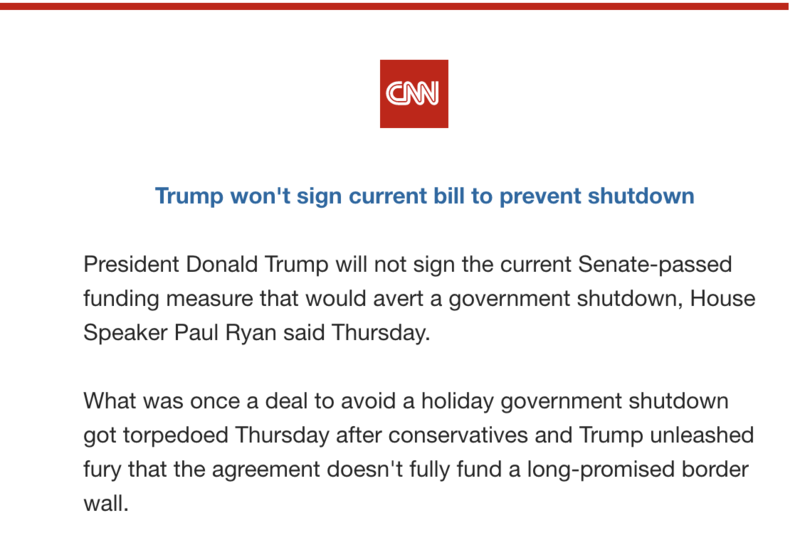 Well, according to my CNN bulletin, Trump, who sounded as if he’d approve Congress’s temporary government-funding measure, had a tantrum and won’t approve it because it doesn’t give him his damn Wall. Here’s the bulletin. I guess that’s the Wall he wants to die on. It’s two days until the shutdown, and CNN gives updates here. UPDATE: Defense secretary James Mattis is leaving in February. What a debacle this administration has been! This entry was written by whyevolutionistrue and posted on December 20, 2018 at 2:30 pm and filed under Trumpiana. Bookmark the permalink. Follow any comments here with the RSS feed for this post. Both comments and trackbacks are currently closed. I’m sick of this BS. I’m starting to think Mexico isn’t going to pay for the wall: And my doubts are only growing. I thought that the Mexican president answered this in words of Trumpian succinctness. There – I said something almost nice about Trump – he’ll give us some new similes! Earthquakes will ensue, sturm und drang, donner und blitzen. I’m the one to blame for unpredicted eclipses in the next month or so. I will go to Home Depot and build it myself if he wants to die on it. We spent a trillion or do on the Afghanistan war. Put the five billion on the bill. Just a drop in an ever growing bucket. The Donald’s heading into meltdown mode — pulling the troops outta Syria without any consultation with the Pentagon or the State Dept or the National Security Council, lifting sanctions against Russian oligarchs, shutting down the government during the holidays. His whole life, Trump’s been able to lie his way out of any jam he’s gotten himself into — and, when he couldn’t, as a last-ditch resort, he’s taken money from the next scam to buy his way out of the last one. No more. He’s operating under the bright glare of national scrutiny, and the walls are closing in on him. He has no easy exit. No telling what the man will do, inasmuch as he has utter disdain for the rule of law and a complete disregard for well-being of others. KK – we must remember that this stable genius knows more about ISIS than the generals, knows more about the economy than the Fed, and so on. It’s interesting that the only positive feedback on his Syria decision came from Putin, but not really a surprise. I would rejoice if his lies caught up with him and had serious consequences, but I do not see that happening soon. I have that view as well. He may face impeachment and resign before the proceedings get under way. But then he will basically walk away without too many scratches. What he deserves he will not get. There are some on the left saying that they think pulling out of Syria was the right thing to do, but that Trump undoubtedly did it for the wrong reasons. I think that many of think that getting out of Syria and Afghanistan is a good idea [better yet, don’t get in in the first place]. However, we also think that simply saying “We won” and then hit the road is not the way to disengage. Typical Trump chaos – rather than a thoughtful process, Trump demonstrates the inanity of his claim of being a stable genius. Correct. Cut and run is not the same thing as an exit strategy. KK: I might add, also without any consultation with the US’s French and British allies, whose SF on the ground are closely integrated with their US counterparts. Some of the few UK politicians for whom I have any respect any more, such as the Defence Minister Tobias Ellwood, have come straight back and said that this decision is wrong and potentially a disaster. It hands Syria to Putin and Iran on a plate. You’re absolutely right; I should have included the US’s allies in the list of essential parties Trump ignorantly failed to consult with regarding his withdrawal from Syria (and now, according to the latest reporting, from Afghanistan as well). It hands Syria to Putin and Iran on a plate. His white rights told him he looked week and wasn’t keeping his promises. Shutting down the government keeps one. He is also pulling the troops out of Syria which no one wanted him to do except the enemy. Maybe someone does not define this as stupid – who will it be? That would be me. And a lot of other people not blinded by the neos. Removing US troops from Syria is a defensible policy goal. Doing so as Trump has done — without consultation with his own Defense experts, without consultation with our allies, and without any clear and articulated plan for what will happen there next — is reckless and indefensible. Have some understanding to the poor guy! He had to give Erdogan a nice little present, after that blunder of good Saudi friends with Khashoggi. Apparently Putin has praised him for pulling out the troops. Probably asked him to do so. Wonder if T wants to use the money saved by pulling out those troops to build his useless wall? Unglaublich!! He needed to pull the troops out of Syria so that he could send them to the border to augment the troops already there. I have grave doubts whether the president of the United States has the best interests of the United States at heart. I never thought I, or any other responsible United States citizen, would ever need say that. He’s a sociopath for sure. Withdrawing our troops from Syria is exactly what we should be doing. The military industrial complex would keep us over there forever. Time to say no to them and bring the troops home from the Middle East and Afghanistan. Isn’t it odd that you should think this a good thing. The military does not. None of his advisers do. Our Syrian friends, our support team – the Kurds. Trump says that ISIS is dead, but all the experts say no, there is at lest 30 to 40 thousand sill in Syria and Iraq. We have little more than 2 thousand troops in Syria and our costs are minimal because we have friends doing the heavy work. You make almost no sense at all. Maybe you should try for Chief of Staff? I agree. More than once we’ve cozied up to and egged on the Kurds to fight against Assad, and more than once, we’ve abandoned them once they no longer serve our purpose. The same thing is happening again. Of course, Putin and Erdogan are very pleased. How well did this same military do in Afghanistan, Iraq, Libya, etc? The Middle East is a place to avoid militarily. There are too many despicable factions fighting that there is no way for the decent people to succeed. Syria has at least 10 different militias most of which could be described as evil. Trump is right to get out. If we were some third world power and had the simple mind of a Trump I might agree. We are in Syria because we have responsibilities there. As I said, the Kurds are doing the heavy lifting and we are their support. You don’t just pack it in and desert your alleys. You make a good point about the Kurds. Because they were our allies against ISIS, we should help them. However, I cannot imagine even this limited action ending well. The Iranians, Iraqis, Syrians and Turks hate the Kurds. What will we do to defend them? What if the Russian get involved? The greater Middle East (adding Afghanistan, Pakistan, Bangladesh, etc) is a disaster. Unless there is an overwhelming reason to get involved, we should stay out. If we get involved, we need to get out as quickly as is feasible. Maybe but at least his reasons for getting out now, and the way he did it, are suspect. Is he doing it because of some well-thought out philosophy? Or because he listened to his advisers? Or is it to change the subject away from his legal troubles? Or to appease Putin? Certainly his claim that ISIS has been defeated is a lie. Right now i lean toward the last two. His pattern has been to create a distraction when he has a very bad week. Also I do wonder if this is a signal to his Russian handlers. The pee tape stays in the vault. Even fools make good decisions occasionally. Celebrate when they do. I agree the US should never have gone in (2003), but once you are in you don’t just pull out. The Turks will -in all probability- go after and annihilate the SDF/YPG (US comrades in arms). And that will give the remnants of IS occasion to reorganise and before you can say ‘we are out’, the caliphate will be restored back to it’s 2015 ‘glory’. And if the US leaves Afghanistan (I think that invasion was, if not wise at least justified -the 9/11 plotters worked from Taliban controlled Afghanistan), it will fall to the Taliban again in a jiffy. Of course the military does not think it is a good thing. If the USA withdraws from all its commitments abroad and became more isolationist, it could cut its military spending to a small fraction of what it is now. You should never base political decisions on the advice of the military without taking that into account. However, on this occasion, almost everybody with any understanding of the situation in Syria is saying that Trump has made the wrong decision here. I not that includes Trump’s own soon to be ex-defense secretary. In the last sentence not -> note. The question is what can be done about a deeply flawed system that allows one man to behave this way? Amend the constitution to change to a parlimentary governmdnt. Good luck with that. The saintly constitution, dictated by Baby Jesus to George Washington on the banks of the Delaware? Oh noes, we can’t change that! That has never been amended, can never be amended and should never be amended and I’ll fight to the death with my bare arms to get Trump the next two terms as president that he’ll need to properly position Ivanka to take over the throne. He is probably using the wall/shutdown issue to distract from his Syrian withdrawal decision. Tune in tomorrow, to see what he does to distract from the wall/shutdown decision. Fire Mueller? Pardon all who have been indicted or are under investigation? Could happen. Then go back and change mind on the withdrawal and wall demand to distract from firing Mueller or pardoning everyone. It will be interesting to see whether there are the votes in the house to pass the $5Bn. They all assume it will die in the Senate anyway, but there are a lot of house republicans who lost their jobs largely in response to Trump and can make a political statement on their way out the door. Nancy said he doesn’t have the votes in the house. It will be interesting to see what transpires. I think you are going to find out. The house is in the process now of attempting to shove a bill through to add 5 billion for the wall. So this will tell you the answer to that. However, even if it goes through the house it will never make it in the Senate so there you go. By the way, it isn’t Nancy’s vote in the house just yet – it is still the republicans. In a couple of weeks it will be Nancy’s. Yes, but her comment to Trump the other day at the televised “discussion” was that he didn’t have the votes in the (current) house. He didn’t say that, on the contrary, he said he would get the votes in the House effortlessly and immediately, but that it would be pointless because he would not get the 60 votes in the Senate. Yes that is what he said, but Pelosi contradicted him and then challenged him to have a vote in the House if he was so sure he had enough support. And it won’t cost $5Bn. It will be a lot more, of course. Aside from the fact that it won’t work to keep out the relatively few criminal elements. And it won’t cost $5Bn. Trump has a yooooge reputation for fiscal probity, never going over budget or over schedule. Truly he has brought new standards to the construction industry. For my birthday I want the Mueller report as a present for all of us. And a Mueller shaped cake. I think we could see that coming a mile away. Trump never gives up easy. He will be fighting for that wall until the day he leaves the White House, hopefully soon. He actually gives up pretty easily. He’d already backed down on the wall, but he got so much crap for that he had reverse himself. He’ll eventually back down again. I see Jim Mattis is getting the hell out. That’s Sec. of Defense in Trump land. I’m thinking Bolton is going to be our next Sec. of Defense. A scary thought. Morale in the military is now as low as it is in the Justice Department and in the intelligence community. Trump is a disaster, and our nation is in peril. I had a boss once and the joke we liked to use on him was – The beatings will continue until morale improves. Yes well, the real pain that we are under here today is a pretend president that is out of control and out of gas. I am a bit surprised at the shallow, juvenile thoughts, opinions from some of the comments here on this posting. Many of PCC followers are educated adults but there are some who fall short. I would tend to stay silent when a subject pops up I know nothing about but there are some who I guess cannot help themselves. Assigned to Captain Bligh on the Bounty, but probably a joke told by one galley slave to another as long as there have been galley slaves. I don’t think it is in peril, but some other nations are. I guess Mr Mattis was the last ‘adult’ in the play pen, woe on the US. From a geopolitical pov this admin is a disaster for the US -and the ‘West’-, and a great success for Mr Putin. It is clear why the latter wanted Mr Tump to win in 2016. Mr Trump may possibly not be a Russian agent (although we doubt that), but it is close to incontrovertible that he does exactly what a Russian agent would do. Keep it up, Trump, keep it up. My biggest fear is he will actually do something sensible and increase his chances in 2020. Ditto. He has to keep to a manageable level of incompetence. What did Omarosa say? “If you think Trump is a bad president, wait until you get president Pence”, or something along those lines. But on a more positive note, the BBC is reporting that the US senate is discussing a bill that would end the USDA’s practice of killing kittens used to study toxoplasmosis. 61 Republicans AND Democrats have supported the bill thus far, although the USDA is still defending their euthanasia, claiming they would be a risk to people if they were adopted out to families. Vets, however, have pointed out that these 3-month old kitties can be cheaply and easily treated. Sometimes bipartisanship shows up in the most surprising places. Fingers 🤞 (and paws) 🐾 crosses that this passes. It may be the only thing our congress can agree on for the foreseeable future. Damn, is using Kittens really necessary? Since cats are hosts, I guess so, but why kittens specifically and why they have to die when you get the eggs from faeces quite easily and naturally. It’s all quite unnecessarily cruel. I think that with adult cats, chances are high that they will have contracted toxoplasmosis naturally, will have built immunity and will not excrete sporocysts with their feces. As I’ve always believed, Trump is acting as if he’s a mafioso don. In this case if anyone crosses him he can’t rub them out like he would like to. How the GOP can stand this dictatorial crybaby is beyond me. However the midterms showed that the tide is turning and 2020 is shaping up to be their disaster. Trump will take longer than I thought neutralize, but secretive Hillary would have been just as bad or worse from the military angle and almost impossible to neutralize. Now that the iron-fisted control on two major parties have been weakened, we will perhaps be able to get some reasonable choices for leadership in the next election. No reasonable person could think Hillary would have been just as bad. That’s part of the propaganda that got Trump elected. Hillary has a good track record as an elected official and her presidency would likely have had the same. Yeah, she has some secrecy issues, but they’re grade school compared to Trump’s graduate-level corruption. Here is a video of Hillary agitating for the destruction Syria’s airfields (and air force) after a sarin gas incident, likely a black flag operation by anti-Assad terrorists since, as it turns out, the only witnesses were rebels who themselves suffered no casualties in the “attack”. My reasoning is pretty well intact. “Deplorable” Hillary would have been both a disaster for the nation and a tragedy for the Democratic party. But Trump also looks and acts like a disaster. For once, I agree with Maya. IIRC, Hilary was not the only one to believe that attack, almost everybody did. Would anyone care to bet Trump’s reaction would have been more considered or rational? “President Donald Trump reversed his position on a possible government shutdown Thursday amid rising anger from his conservative base on several fronts. He cannot stand to be seen as weak by those who support him. Mitch McConnell is even fuming over the resignation of Mattis. He said we should stick to our post WW2 alliances. Where was he for the last 2 years? Republicans are finally starting to see the cost of their Faustian bargain. Their future just got a lot bleaker. I’ve long thought that Trump is increasingly holding the US hostage. Try and remove him and he will ruin the country. This process has just been ratcheted up another notch. It is up to the senate now to pass the bill with the money for the wall and avoid the shutdown. Let’s see if the come though and do their job to keep the government from shutting down. I can’t run with your crew no more. Y’all too cray-cray for me.